An RNC resolution, approved today, calls transgender identity “a disqualifying psychological and physical” condition. The Republican National Committee, at its winter meeting, today endorsed Donald Trump’s effort to bar transgender people from military service. The committee, without public debate, approved a resolution backing Trump’s call for the military to consider transgender identity “a disqualifying psychological and physical” condition and praising his “intent and prerogative to strengthen our military with sound personnel policies,” the Associated Press reports. It also encouraged the Department of Justice to take the matter to the U.S. Supreme Court if need be. Trump announced reinstatement of the ban, which had been lifted in 2016 under President Barack Obama, via Twitter last July. However, four lawsuits have been filed against the ban, and in all of them, federal judges have granted injunctions to block the ban while the cases are being heard. 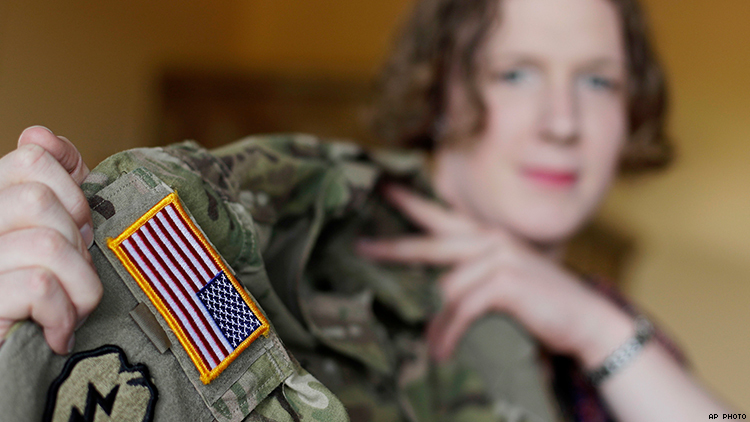 The lifting of the ban in 2016 had meant trans troops who had been closeted could serve openly without fear of being discharged solely for their identity, and the armed forces planned to enlist new transgender recruits beginning July 1 of last year, a date that the Trump administration pushed back to the beginning of this year. New enlistments would have been blocked indefinitely and trans troops already serving would start being discharged if the courts hadn’t granted the injunctions. “It’s customary for the RNC to pass resolutions supporting the president, especially when policies are challenged in court,” the AP notes. However, some Republican senators have opposed the ban or at least expressed reservations about it; they include John McCain, Richard Shelby, Orrin Hatch, and Joni Ernst. Democrats and LGBT rights groups were quick to denounce the RNC’s action. “Over the last month alone, the Trump-Pence administration has rolled back significant protections for the LGBTQ community, ripped apart families, and allowed health care workers to discriminate access to medical care,” said a statement issued by Lucas Acosta, the Democratic National Committee’s LGBTQ media director. “Today, the RNC decided to go even further and pass a hateful resolution, which only serves to subvert and further demean hardworking men and women who want to serve their country in the most honorable way they can. The RNC has proven they are more than willing to deny basic rights to LGBTQ Americans all while accepting money from an accused sexual predator and funneling money to an alleged child molester,” references to Trump and failed U.S. Senate candidate Roy Moore, respectively. “Every American deserves respect and Democrats will not rest until every American is given the opportunity, respect, and rights they deserve under the Constitution,” Acosta continued. “President Trump’s bigoted proposal to purge qualified military personnel is in direct contradiction to the will of the American people and what’s best for our nation’s security,” said Sarah Kate Ellis, president and CEO of GLAAD, in a press release. “The fact that the RNC is siding with blatant discrimination over supporting the rights of brave Americans to serve our nation displays how toxic and deeply rooted the Trump administration’s anti-LGBTQ ideology has become.” GLAAD further noted that polls show a majority of Americans in all 50 states oppose the ban.